BERKELEY, CA – Telomere crisis is an important early event in the development of breast cancer, and its occurrence can be identified with precision, according to recent findings by a team of scientists at the Department of Energy's Lawrence Berkeley National Laboratory and the University of California at San Francisco. Their report is now available through advance online publication of Nature Genetics. A schematic representation of the genomic events associated with breast cancer progression, including the occurrence of telomere crisis. Joe Gray, director of Berkeley Lab's Life Sciences Division and a professor of laboratory medicine and radiation oncology at UCSF, is one of the paper's lead authors, with Koei Chin and Britt Marie Ljung of UCSF; Carlos Ortiz de Solorzano, Paul Yaswen, and Martha Stampfer of Berkeley Lab; and Stephen J. Lockett from the National Cancer Institute. In the breast, cells in a milk-collecting duct occasionally proliferate excessively due to development of a regulatory defect. Gray and his colleagues postulate that this results in a lesion called "usual ductal hyperplasia." "The chromosomes in these growing cells lose a hundred or so base pairs of DNA every time they divide," Gray explains, "because the usual DNA replication processes don't copy DNA all the way out to the ends of the chromosomes. This erodes the DNA sequences that interact with proteins to form structures called telomeres, which protect the chromosome ends." Eventually the DNA ends erode so much they can no longer protect the chromosomes. When this happens the chromosomes become unstable, and damage-control mechanisms kick in that kill the unstable cells. 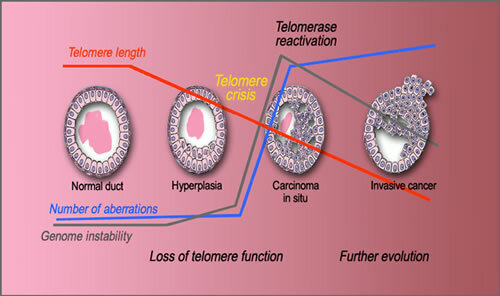 This process, known as "telomere crisis," normally protects against inappropriate long-term cell growths like cancer. Gray and his colleagues believe that "very rarely, the chromosome instability activates a specialized DNA-replication complex, telomerase, which can restore telomeres. Cells in which telomerase is activated can then proliferate indefinitely to form the next stage of cancer, known as 'ductal carcinoma in situ.'" Should the cancer progress further, it next invades other parts of the breast and may escape to other organs. Not all cancer researchers agree that telomere crisis in hyperplasia, followed by reactivation of telomerase, leads to carcinoma in situ  and thence, sometimes, to invasive cancer; they assign cancer to other causes. Partly the disagreement arises because sequential events can't be followed in individual tissue samples from living subjects. "In human studies, the order from normal ducts, to ductal hyperplasia, to ductal carcinoma in situ, to invasive cancer is just association," says Gray, "because we can't look at the same tissue all the way through the crisis." Therefore the researchers compared the assumed sequence of events in tissue with what happened when they induced a culture of human mammary epithelial cells, HMEC, derived from normal breast tissue, to undergo telomere crisis and immortalization. Says Gray, "With HMEC in vitro we can follow the progression all the way through crisis, compare this to what we observe in actual tissue specimens from patients, and see if they are similar." Using 3-D confocal microscopy and working first with breast-cancer tissue samples, at each stage the researchers assessed genomic instability and such correlated features as the amount of DNA content, signs of rearranged chromosomes, and the number of copies of genes known to play a role in cancer. These measures increased, on average, from the hyperplasia stage to the invasive cancer stage. 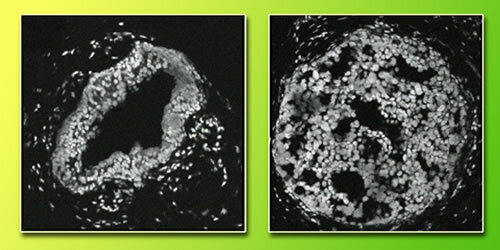 These confocal microscope images highlight regions of chromosomes in cells of a breast duct exhibiting hyperplasia (left) and one exhibiting carcinoma in situ (right). They also measured mean telomere lengths of cells at each stage. They found that mean telomere length decreased from normal tissue to carcinoma in situ, and decreased even more in invasive cancers. When they looked at cultured human mammary cells, the researchers found a remarkably similar series. To induce telomeric crisis and subsequent immortalization in these cells, they introduced a known breast cancer gene into the culture and examined progressive generations of cells. Telomere length decreased steadily. Genome instability and evidence of rearranged chromosomes were low before telomere crisis  just as in the tissue samples of usual ductal hyperplasia  and highest during the crisis, as in the samples of ductal carcinoma in situ. Instability then decreased, and changes in genome complexity leveled off, as in invasive cancer tissues  where critically short telomeres are presumably maintained by reactivated telomerase. The mammary cell culture studies also confirmed that the probability of successful passage through the telomere crisis is low  most cells damaged because of shortened telomeres can't evade cell death. In fact, women with usual ductal hyperplasia are only slightly more at risk of developing invasive cancer. When carcinoma in situ does form, it is probably from a single cell that has managed to reactivate telomerase. "Our research establishes two things," Gray says. "First is that telomere crisis does appear to play an important role in the development of most breast cancers. Second is where it occurs: at the transition from hyperplasia to carcinoma in situ." These findings suggest that people at higher risk of developing cancer can be identified in advance by measuring telomerase activity, genome instability, and other signals in the clinic. The findings also point to possible ways of stopping cancer by derailing transition through the telomere crisis (rare as successful transition is): by using drugs that maintain the cell's damage-control mechanisms, for example, or that prevent telomerase reactivation or that poison cells in which telomerase is already active. Some of these possible preventive agents are already being tested. "In situ analyses of genome instability in breast cancer," by Koei Chin, Carlos Ortiz de Solorzano, David Knowles, Arthur Jones, William Chou, Enrique Garcia Rodriguez, Wen-Lin Kuo, Britt-Marie Ljung, Karen Chew, Kenneth Myambo, Monica Miranda, Sheryl Krig, James Garbe, Martha Stampfer, Paul Yaswen, Joe W. Gray, and Stephen J. Lockett, will appear in Nature Genetics and is now online.